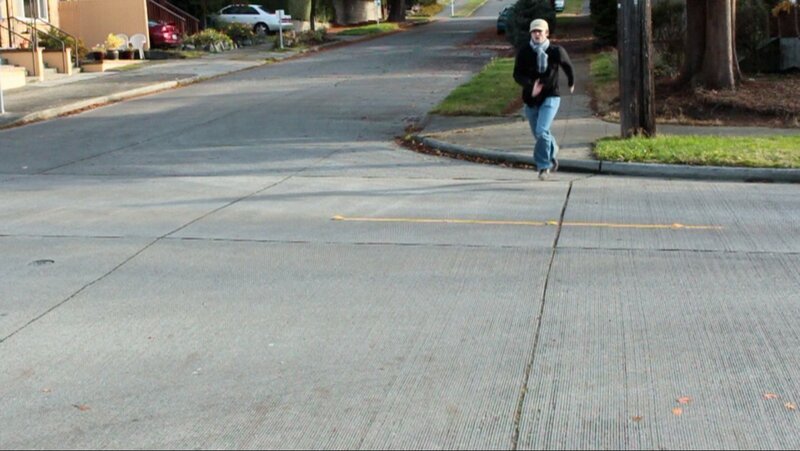 Unmarked Crosswalk from Matthew Whitney on Vimeo. Half a block from my house is located an intersection at which two sidewalks meet. The state of Washington has a law, 46.04.160,which states that a crosswalk constitutes any space within the intersection of a roadway where two sidewalks converge(wsdot.wa.gov). A crosswalk, then, is not always painted stripes in the road. Indeed, the State has a lawful name for this; the“Unmarked Crosswalk”. The unmarked crosswalk is present and enforceable by law at any city intersection, and automobiles mustyield and stop for any pedestrians walking within the space of the unmarked crosswalk, or bodily implying the intention of using theunmarked crosswalk. This would seem to constitute a massive distribution of state power into the hands of the pedestrian. In thepractice of this law however, this power evaporates into meaninglessness. Even if one were to look past the dangerous infrastructuralspace, woe to the bodily walker who trusts this word of law into the hands of automobile drivers. My experience is that nine times outof ten, no car will yield, no matter the intention of the walker. Police cars routinely drive past at the unmarked crosswalk, similarlyignoring the law that they are supposedly equipped and enabled to enforce. One could say that the pedestrian is marginalized byhegemonic automobile practices, but in truth it is that the social practice of the space dictates its use, and in this case completelynegates any lawful procedures codified by the state. The unmarked crosswalk is less than vapor. It is less than anything, it is nothing.Similarly, the abstract space of law does not always produce dominant space. The written word has no potency except in socialpractice, and it is because of this that revolution is inherent in all space, even supposedly impervious ones.